A pair of JFK Islander student athletes had a college signing day Friday afternoon at the JFK gymnasium. Alschea Grape and Jonah Hahn held a small press conference as they signed their respective letters of intent to enter the next chapter in their academic and athletic careers. Grape, an aggressive point guard and a leader on the court, will play basketball at Enderun College. Hahn, a multi-sport athlete, announced he will focus on football and will play tight end at Linfield College in Oregon. Grape will leave this summer and will be a three hour plane ride away at the Enderun campus in the Philippines. Grape was the leading scorer (17 points per game) for the Islanders and looks to use his skills to contribute to his new team, the Enderun Titans. Grape will not be the only Guam-based athlete playing basketball at Enderun, he will join incoming freshman Kyle Gaitan from FD on the men’s team as well as Joy Pangilinan who will enter her junior year at Enderun. “Kyle and I both put in a lot of hard work and it looks like we will be rooming together when school starts,” said Grape. 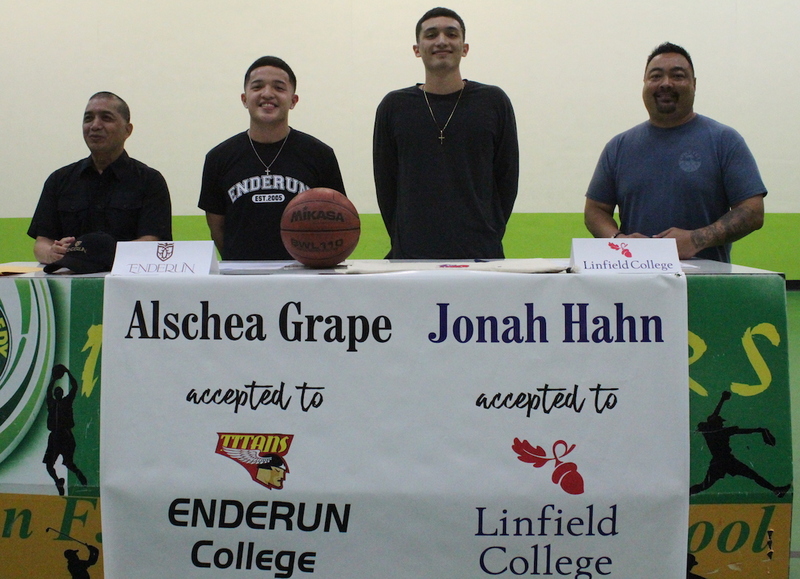 JFK Islander Alschea Grape will be attending Enderun college in the Philippines. Pangilinan celebrated multiple tournament championships in her underclassmen years at Enderun and has also achieved being selected to the mythical five (all-tournament team) as well. Grape will look to join forces with Gaitan and contribute to the Enderun program to try and follow Pangilinan’s footsteps. Grape said he plans to study in the field of Business. Alschea Grape visited the campus prior to a high school tournament in the Philippines to meet the coaches. The coaches were impressed with the short visit and workout with Grape that they extended an invitation to attend Enderun. “Alschea played for me for three years and Jonah played under me for two years. I’m proud of both of them for putting in hard work and having the opportunities to play sports in college,” said head basketball coach Rey Serafico. JFK Islander Jonah Hahn will be playing football for Linfield College in Oregon. Hahn excelled in both football and basketball and made the all-star team for both sports. He was also named the MVP of the Wendy’s all-star game last month scoring 22 points and grabbing 11 rebounds in the victory. But Hahn will put his post moves on standby, shifting his focus on football. He will look to use his height to help the division III Linfield Wildcats as a tight end. The decision to attend his college of choice was similar to Grapes choice as well with family living nearby the campus. Hahn said his paternal grandmother lives near the campus and he also has an Uncle who coaches baseball at Linfield College. “I’m really excited to start my college career. I chose this particular college because I will have family there to help me and support me,” said Hahn. Hahn thanked his family from Guam, Saipan, Hawaii and Oregon for their love and support. Hahn said he has been in contact with the coaching staff and is currently doing the workouts sent to him. Hahn plans to study in the field of Exercise Science at Lindfield. He also hopes there are more local athletes to have the same opportunities of playing sports after high school. Both athletes will be graduating from JFK over the weekend.